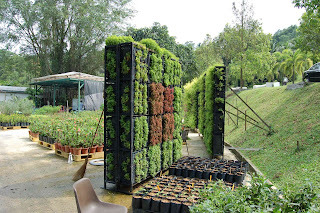 I was taken to a wholesale nursery in Singapore with Alan from Elmich. 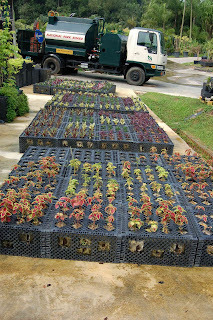 Very unusual to have a nursery in Singapore, land is so expensive so most of their plants are brought in from Malaysia. 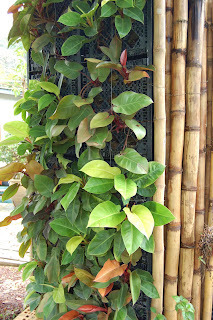 They are running some test on vertical gardens. Their construction and also different plant species. 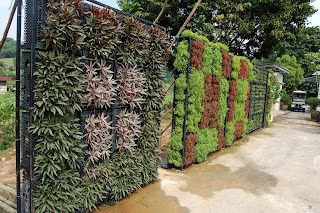 The Singaporean Government has been very supportive and has encouraged them to display the panels in public paces - along the hoarding of construction sites and as barriers in shopping centers. They are currently in the process of construction a Hort Park that is to be run by the national parks. It will enable designers, nurseries, construction companies in the industry to display their products/work etc. There will be a number of green roofs and vertical gardens on display, its due for completion later this year. Subaru have recently opened their 4x drive test drive track on the roof of their show room. It includes intensive garden areas, ponds, waterfalls and the driving track. I was invited to attend a lecture presented by the head of World International Green Roof Assoc. he was in Singapore for another conference and presented a talk at very short notice to a packed room at the Botanic Gardens. I will be in contact with him at the conference and attending the World International Green Roof meeting as the representative of Green Roofs for Healthy Aust Cities, in Minneapolis so it was a good opportunity to meet him prior.